JBL MRX512M Two-way Portable Monitor DJParts - All Variety of Parts that DJ Needs. The MRX512M is a premium, utility/monitor speaker. The MRX512M uses a JBL 262H 305 mm (12 in) Differential Drive® woofer and a 2408H 37.5 mm (1.5 in) annular polymer diaphragm, neodymium compression driver. A 70° x 70° horn provides smooth, even coverage whether used in the vertical (mains) or horizontal (monitor) orientation. NL4 connectors are provided on both ends of the speaker to keep cable runs tidy on stage when used in the monitor application and for easy access when used on tripods. A passive network provides accurate reproduction throughout the cross-over region. For use on a tripod or over a subwoofer, JBL's dual angle pole mount is included. This feature allows the speaker to be mounted in a vertical position or with a 10° down tilt for optimum audience coverage. 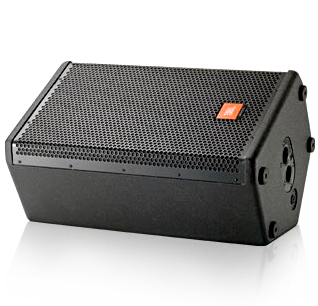 The enclosure is constructed of quality plywood and coated in JBL's rugged DuraFlexT finish. The attractive CNC-machined, 16-gauge steel grille wraps around the sides of the enclosure. The grilles are internally lined with an acoustically transparent screen to provide additional driver protection and give a very professional appearance.